Federal Insurance & Mitigation Administration Risk Reduction Policies. Provides guidance on the NFIP regulations concerning the requirement for openings in below-Base Flood Elevation foundation walls and walls of enclosures for buildings located in Zones A, AE, A1-A30, AR, AO, and AH. The 2011 CCM, 4th Ed. 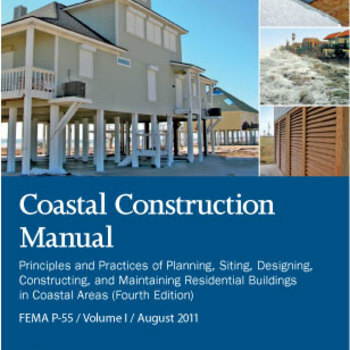 (FEMA P-55), is a 2-volume publication that provides a comprehensive approach to planning, siting, designing, constructing, and maintaining homes in the coastal environment. Volume I provides information about hazard identification, siting decisions, regulatory requirements, economic implications, and risk management. The primary audience for Volume I is design professionals, officials, and those involved in the decision-making process. Volume II contains in-depth descriptions of design, construction, and maintenance practices that, when followed, will increase the durability of residential buildings in the harsh coastal environment and reduce economic losses associated with coastal natural disasters. The primary audience for Volume II is the design professional who is familiar with building codes and standards and; has a basic understanding of engineering principles. This bulletin is primarily intended to assist local floodplain management officials with responsibility for administering the community floodplain management ordinance and to assist land surveyors, architects, and engineers who are authorized by law to certify elevation information on the Elevation Certificate. Insurance professionals who use the Elevation Certificate for insurance rating purposes may also find this bulletin useful. The information contained in this Floodplain Management Bulletin is not intended to replace the Instructions section of the Elevation Certificate, but to supplement them. Provides guidance for implementing the FY06 FMA program. Provides guidance on implementing the FY05 FMA program. Fiscal Year (FY) 2007 Repetitive Flood Claims (RFC) grant program provides funding to reduce or eliminate the long-term risk of flood damage to structures insured under the National Flood Insurance Program (NFIP) that have had one or more claim payments for flood damages. FEMA produced this series of 37 fact sheets to provide technical guidance and recommendations concerning the construction of coastal residential buildings. The fact sheets present information aimed at improving the performance of buildings subject to flood and wind forces in coastal environments. Photographs and drawings illustrate National Flood Insurance Program (NFIP) regulatory requirements, the proper siting of coastal buildings, and recommended design and construction practices for building components, including structural connections, the building envelope, and utilities. The objective of the Community Rating System (CRS) is to reward communities that are doing more than meeting the minimum NFIP requirements to help their citizens prevent or reduce flood losses. The CRS also provides an incentive for communities to initiate new flood protection activities. The CRS Coordinator’s Manual is the guidebook for the CRS and sets the criteria for CRS classification. It explains how the program operates, what is credited, and how credits are calculated. Although it is primarily a reference for CRS activities and credits, it can also help guide communities that want to design or improve their floodplain management programs. Fiscal Year (FY) 2008 Pre-Disaster Mitigation Program Guidance – The Pre-Disaster Mitigation Program Guidance (PDM) grant program assist States and communities to reach a higher level of risk management and risk reduction through hazard mitigation planning and the implementation of mitigation projects and activities prior to a disaster event. The Federal Emergency Management Agency (FEMA) proposes to enter into a Cooperative Agreement for an estimated $330,000 with one (1) national, non-profit technical earthquake society (architects, engineers, planners, public officials, social scientists) composed of a membership from practicing professionals, educators, government officials, and building code regulators. The purpose of the guidance in this document is to assist FEMA and partners in preparing, developing, and managing grant activities. Provides guidance to FEMA regional offices and states on conducting Community Assistance Contacts (CACs) and Community Assistance Visits (CAVs), to meet the monitoring requirements for community NFIP participation. This document is primarily intended for FEMA Regional Office Staff and State Staff. FEMA proposes to enter into a Cooperative Agreement for an estimated $850,000 with three Earthquake Consortia for the purposes of supporting nonprofit organizations which: deliver education and training to community and State officials; develop seismic policies and share information to promote programs intended to reduce earthquake-related losses; and reduce the loss of life, injuries, property losses, and social and economic disruption that results from all hazards. Completed applications must be submitted no later than 11:59 PM Eastern, August 17, 2011. FEMA proposes to enter into a Cooperative Agreement for an estimated $355,000 with one (1) national, non-profit technical earthquake society (architects, engineers, planners, public officials, social scientists) composed of a membership from practicing professionals, educators, government officials, and building code regulators. Completed applications must be submitted no later than 11:59 PM Eastern, September 8, 2011. This is a guidance document. The HMGP Expanded Mitigation Strategies will provide funds to eligible applicants to identify and plan feasible mitigation projects, and incorporate those projects into their local mitigation plans. This is available for DR-1602, 1603, 1604, 1605, 1606, 1607, 1609. The HMGP Reconstruction Grant Pilot will provide a mitigation alternative for areas affected by Hurricanes Katrina, Rita and Wilma in the following states: Louisiana, Texas, Mississippi, Alabama and Florida. This Bulletin provides information about a community’s responsibility in adopting the Flood Insurance Rate Maps as a participant in the NFIP. A Flood Study and Adoption Timelines Is provided.